It looks like HBO is teaming up with Interstellar writer and Person Of Interest showrunner Jonathan Nolan to adapt the highly revered and beloved Foundation books into a TV series. Wow. The Wrap is reporting that Jonathan Nolan will be working with HBO for yet another series. The Interstellar writer is currently working on a TV adaptation of Westworld for HBO, and now he has allegedly turned his attention towards the groundbreaking work of Isaac Asimov's Foundation. This is happy news, as Foundation was once set to be adapted into a film by Roland Emmerich. But Foundation is a pretty seminal work of science fiction, so needless to say we're pretty nervous. HBO will be teaming up with Warner Bros. TV in hopes of producing a series. No word on how many episodes this "series" will contain or if it will be set up as a miniseries, however the books have enough material to last a very long time. 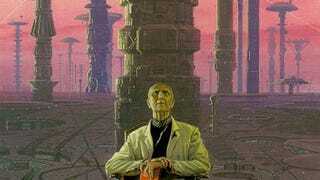 The series is set on a remote planet called Terminus where mathematician and psychologist, Hari Seldon was exiled (for clarification purposes although he never physically makes it there) due to his ability to predict the crumbling of the Galactic Empire. On Terminus, a group do artists, academics and engineers attempt to start a new society and the series just jettisons off from there. It's really so much more than just this description and the series jumps ahead as Terminus grows and expands. Fingers crossed for this one.